In a world where national security means cyber-security, where do we draw the line? At what point does the acquisition of information for national security purposes violate our constitutional privacy rights? This post will trace how information warfare objectives of the post-cold war era changed in the wake of the September 11, 2001 terrorist attack, morphing into the mass surveillance system we see now, in an alleged attempt to thwart real world terrorist plots. As we find ourselves at the cross section between cyber-terrorism and cyber-espionage, we will examine the constitutional basis upon which the NSA acted. While news of the now defunct secret email metadata dragnet surveillance program shocked Americans, what’s more shocking is how we got to this point—through a series of small concessions made in favor of law enforcement efficiency and the all-encompassing “public interest” that trumps any balancing test, even when weighed against our constitutional rights. Although reports indicate that data collection of this scale began almost immediately on the heels of the September 11, 2001 terrorist attack, these actions were not sanctified by a secret court until around 2004. This date is by no means precise as it was never made public knowledge. Rather this is the rough estimate that can be gathered from a heavily redacted opinion written by then-presiding Judge Kollar-Kotelly, of the Foreign Intelligence Surveillance Court (FISC). Picture of the 2004 FISC opinion released in response to FOIA request. Although the FISC authorized this mass surveillance sometime in 2004, it is believed that President Bush secretly authorized the National Security Agency (NSA) to conduct a warrantless wiretapping program known as the Terrorist Surveillance Program (TSP) as early as 2001. The TSP was designed to intercept international telephone calls and e-mail messages coming into and leaving the United States without court oversight. This is not the first time on our nation’s history where officials have attempted to use warrantless wiretaps under the guise of imperative national security measures. However, in the 1970’s came the Foreign Intelligence Surveillance Act (FISA), which imposed limitations on the eavesdropping practices on American citizens for national security purposes and was passed in order to prevent telecommunication companies and the government from colluding to spy on Americans. Prior to passage of the act, the Supreme Court affirmatively stated that “[t]he Fourth Amendment does not contemplate executive officers as neutral and disinterested magistrates, and Fourth Amendment freedoms cannot properly be guaranteed if domestic security surveillances may be conducted solely within the discretion of the executive branch.” It’s clear that FISA reflected the SCOTUS’ opinion that even in the face national security matters, the Fourth Amendment stands paramount. Consequently, with many eavesdropping practices outlawed by FISA, the government has taken steps to amend the act, circumvent the parameters of the act, and take steps to conceal surveillance activities—like TSP. Once such amendment, which broadened the government’s ability to conduct warrantless wiretaps under FISA, was 50 U.S.C.A. § 1885b. This amendment prohibits any state from maintaining an action against a service provider, investigating warrantless wiretaps made at the request of the government, and prohibits release of information of records relating to warrantless wiretaps of the providers customers for national security purposes. Effectively, this dismissed all of the pending suits against service providers regarding the warrantless wiretaps and governmental intrusion, thereby halting any attempts to prove that the government had violated FISA as all alleged evidence of such a violation would be considered protected as a national security matter. Nevertheless, allegations that these amendments to FISA were unconstitutional, specifically that preempting state investigations or required disclosure of information about relationship between individual electronic communication service providers and the intelligence community, preempted the state’s right to sovereignty. However, after judicial review these amendments were upheld and did not violate the Tenth Amendment. In dismissing these cases, the reviewing court stated that because the amendment did not “commandeer” state officials, but rather, prohibited state investigations into certain activities in furtherance of national security goals, the amendments were constitutional. Once again, we see the court (not in so many words, but functionally) balancing our constitutional rights against the backdrop of national security interests. Support for the idea that out right prohibiting investigation is somehow less restrictive that commandeering an investigation, comes from the common law evidentiary privilege, known as the state secrets doctrine. This doctrine allows the government to withhold allegedly secret evidence from courts and to block unwanted lawsuits when “secret government activities might be uncovered by a lawsuit . . . . that might harm national security.” This doctrine was invoked in response to all cases challenging the constitutionality of the TSP. For instance, a court dismissed a plaintiffs’ data-mining claims relying on a bare assertion of a state secret privilege. The court preemptively concluded that a prima facie case could not be made without use of information protected by the privilege and “further litigation of this issue would force the disclosure of the very thing the privilege is designed to protect.” Furthermore, the court found that the NSA’s admitted use of warrantless wiretaps pursuant to TSP, which intercepted enormous amounts of data from U.S. citizens from personal telephone and email communications, did not constitute “electronic surveillance” as defined by FISA. Instead, the court found that FISA’s definition of electronic surveillance was sufficiently limited and TSP had successfully circumvented that definition in order to carry out their surveillance of potential terrorists. In accordance with the early 2000 judicial response, the Supreme Court recently rejected a case (without comment) challenging the NSA spying program which became public knowledge after Edward Snowden’s leak in 2011. However, can the same rational hold up in this balancing test given how the amount and depth of information may tip the scales in favor of privacy interests? The average cell phone of 2013 is more powerful, and holds more data, than any computer of 2001. Surveillance of e-mails in 2001 meant something very different than it does in 2013. Furthermore, just as our technologies have advanced so has the NSA’s ability to analyze the data obtained from these operations. Recently news broke of XKeyScore, which allows analysts to search with no prior authorization through vast databases containing emails, online chats and the browsing histories of millions of individuals. In defense of these types of invasive operations, General Keith Alexander points to the effectiveness of information warfare against cyber-terrorism as well as traditional terrorism, crediting the collection of US phone records’ metadata as disrupting a 2009 plot to bomb the New York City subway system. However, the success rate of any government program is not determinative as to whether and to what extent it impinges on civil liberties. Either a Terry-stop violates the Fourth Amendment or it does not. It doesn’t matter the probability of finding weapons on a person. Some scholars point to the President’s war making power as the only justification necessary for programs like TSP and the NSA’s continued mass surveillance, saying “[t]o exercise that power effectively, the President must have the ability to engage in electronic surveillance that gathers intelligence on the activities of the enemy.” But the President is also tasked with faithfully executing the laws of the United States—of which the United States’ Constitution stands paramount. To trample on the Fourth Amendment under the pretext of the Executive Branch’s war powers not only makes a mockery of the law the President was tasked to uphold, but undermines what our country is fighting for in establishing these defensive national security measures in the first place. See David Kravets, Sobriety Checkpoints Paved Path to NSA Email Spying, Wired (Nov. 19, 2013), available at http://www.wired.com/threatlevel/2013/11/nsa-web-metadata. Id. FISC is a special court consisting of federal district court judges appointed by the Chief Justice of the U.S. Supreme Court, to review applications for intelligence surveillance under the Foreign Intelligence Surveillance ACT (FISA). Michael C. Miller, Standing in the Wake of the Terrorist Surveillance Program: A Modified Standard for Challenges to Secret Government Surveillance, 60 Rutgers L. Rev. 1039, 1051 (2008). Kravets, supra note 106. 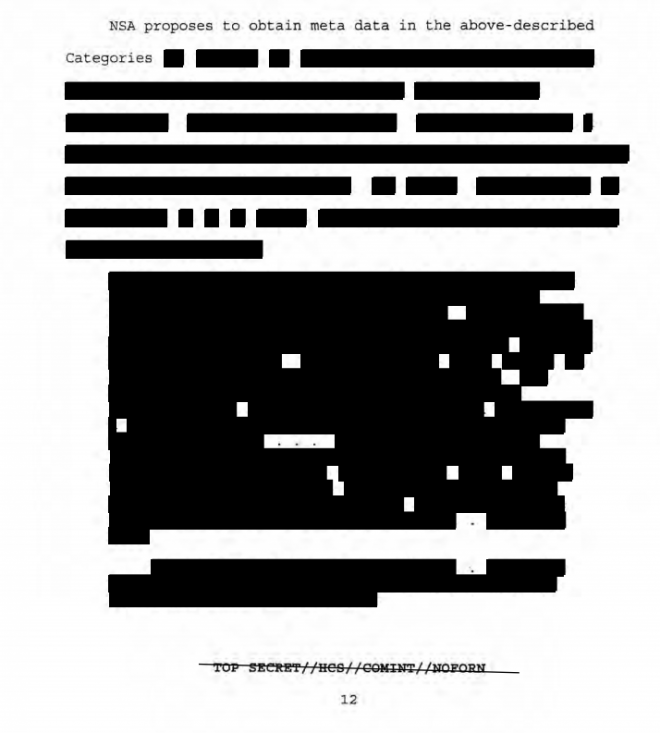 These heavily redacted documents were released pursuant to a Freedom of Information Act (FOIA) request made on behalf of the American Civil Liberties Union. Id. Michael C. Miller, Standing in the Wake of the Terrorist Surveillance Program: A Modified Standard for Challenges to Secret Government Surveillance, 60 Rutgers L. Rev. 1039 (2008). United States v. U.S. Dist. Court for E. Dist. of Mich., S. Div., 407 U.S. 297, 317 (1972). See 50 U.S.C.A. § 1885b (West 2008). In re Nat’l Sec. Agency Telecommunications Records Litig., 630 F. Supp. 2d 1092 (N.D. Cal. 2009). Margaret Ziegler, Pay No Attention to the Man Behind the Curtain: The Government’s Increased Use of the State Secrets Privilege to Conceal Wrongdoing, 23 Berkeley Tech. L.J. 691 (2008). Id. at 1059-60 (quoting Am. Civil Liberties Union v. Nat’l Sec. Agency, 493 F.3d 644 (6th Cir. 2007)); see also Terkel v. ATT&T Corp., 441 F. Supp. 2d 899 (N.D. Ill. 2006) (intervening government’s successful invocation of the state secrets privilege barred any discovery of information that would allow plaintiffs to establish standing). See Am. Civil Liberties Union v. Nat’l Sec. Agency, 493 F.3d at 682. David Kravets, Supreme Court Rejects Case Challenging NSA Phone Spying, Wired (Nov. 18, 2013), available at http://www.wired.com/threatlevel/2013/11/scotus-phone-metadata-spying/. Rory Carrol, NSA director Keith Alexander insists mass surveillance programs respect privacy, The Guardian (July 31, 2013), available at http://www.rawstory.com/rs/2013/07/31/nsa-director-keith-alexander-insists-mass-surveillance-programs-respect-privacy/. John Yoo, The Terrorist Surveillance Program and the Constitution, 14 Geo. Mason L. Rev. 565, 571-72 (2007).